All we lost was a third. Swapping fourths seems unnecessary. ? We actually moved up in the fourth. Can’t blame for this deal. This was probably a cheaper alternative than to trade up for Chubb. 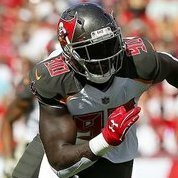 Gave up a third for JPP which imo worth the risk when your job is on the line and this class isn’t deep of edge rushers. Nelson, Barkley, and James are our draft targets. I'm guessing my "Davenport at seven no matter what" theory is kinda shot now. lookin good... how was he last year? I know the whole team was terrible last year j/w how he was. Going to be a nice look can't wait. I still think we should take a DE in the draft but a bit later :). So what you think for the 7th is it a DB? Has Licht bought a house in Tampa yet because he should. Maybe we liked what we saw from Derwin James at his pro day. Or maybe we laid a couple foundations for trade downs. Or maybe we heard rumblings that Nelson/Barkley could fall. Or maybe we failed to trade for Quinn so we kept trying until we got someone and I'm hoping too much. Derwin James. Then we will draft our running back in the second. Lol... lots of possibilities. I kinda want Derwin James over Minkah. I dunno about Ward but it seems he could be the pick because I feel we are going to need a CB more than a Safety. I am not sure how Minkah would fit at CB i don't think he can be a guy that could play outside IMO. I can't say what I'd do. ? Yea I really like Derwin James but Saquan would be awesome if he was there or Nelson... What if Chubb is still there at 7 would we take him? What if Saquan and Nelson are gone and there is Chubb just sitting there?